The Protect-O-Plate — a thin metal plate or plastic card issued to car owners starting in the '60s to help dealers track warranty work — has become a "buzz word" for collectors wishing to document the authenticity of their vehicles. Apparently the term "Protect-O-Plate" was used solely by General Motors. However, Ford used a similar plate attached to a Warranty Identification Card. The National Corvette Restorers Society says Chevrolet began providing Protect-O-Plates to owners in 1965. However, a Pontiac Dealer Service Bulletin issued in September 1966 notes that "owner plates" were provided for 1964 models." The same bulletin announced a change in the way plates were going to be furnished to owners. It stated that the factory would no longer issue them. Instead, dealers were to buy a Model M-14 Dymo (reverse print) Tapewriter embossing machine, so they could emboss blank plates at the dealership level. 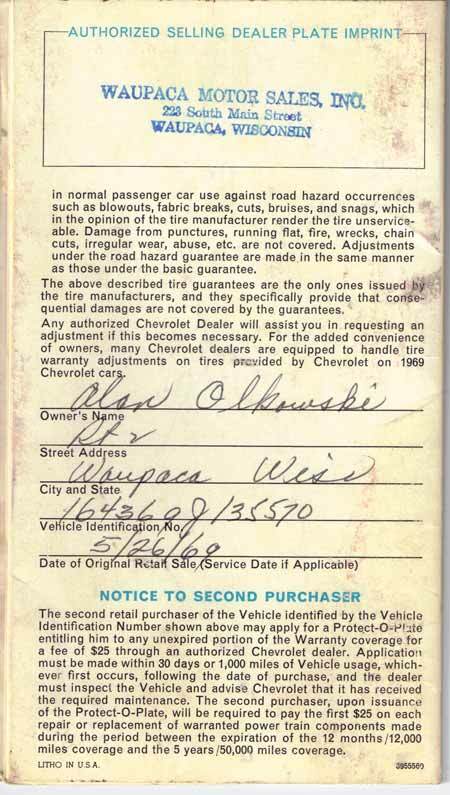 This scan shows an original Protect-O-Plate for a '69 Chevy Impala V-8 station wagon sold May 26, 1969. The letters made with the Tapewriter are reversed so they'll print out correctly on documents the plate is used to process. Click on the image for larger view. As you can see, the plate was affixed to a flap on the upper left corner of the Chevrolet New Vehicle Warranty booklet and was not supposed to be removed from the booklet. Click on image for larger view. Whether they came from the carmaker or dealer, the plates were designed to stick on the inside back cover of the Owner Protection Plan Booklet that each new-car buyer received. The cover of the booklet stated, "The Owner Protection Plan and the Pontiac New Vehicle Warranty contained herein applies to the Vehicle identified on the Protect-O-Plate attached hereto." The cover wording also specified that "The booklet with the Protect-O-Plate attached must be kept with the vehicle at all times" and further that "The booklet and Vehicle data portion of the Protect-O-Plate must remain with the Vehicle at time of resale." If you think all this sounds like a lot of legalese, you're right. In the '50s, most cars had short 90-day/1,500-mile warranties. By the '60s, extended warranties became a marketing tool, but periodic service was required. Regular maintenance brought new business to dealers that helped pay for any repairs made under longer warranties. Protect-O-Plates and Warranty Identification Cards allowed dealers to document that car owners were fulfilling routine service obligations. Each time the car came in for an oil change or tire rotation, the information on the plate was transferred to document that the work was done. The bottom paragraph on this page of the warranty booklet contains a Notice To Second Purchaser telling he or she how to apply for a Protect-O-Plate to keep unexpired warranty coverage in effect. A second plate cost $25 in 1969. The data embossed on GM Protect-O-Plates included the customer's name and address, the car (or truck) delivery date and the vehicle identification number. Sometimes the information embossed on the card included codes for paint colors, interior trim and both standard and optional equipment. However, the option information was usually limited to the more popular choices. 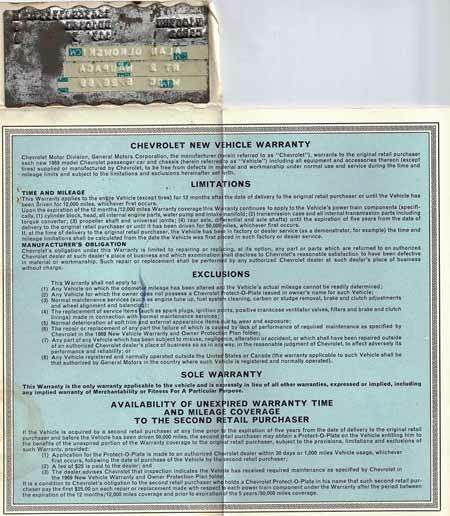 Here is the cover of the 1969 Chevrolet New Vehicle Warranty and Owner Protection Plan with the flap holding the Protect-O-Plate raised above the fold. The plate is affixed to the back of the flap. Some rules are spelled out here. After the National Traffic and Motor Vehicle Safety Act of 1966 went into law in 1967, automakers were required to be able to contact vehicle owners in case a product defect was found and a recall was required. This made the Protect-O-Plate even more important, at least for a while. Dealer service bulletins noted, "this will help us live up to requirements of the new law." 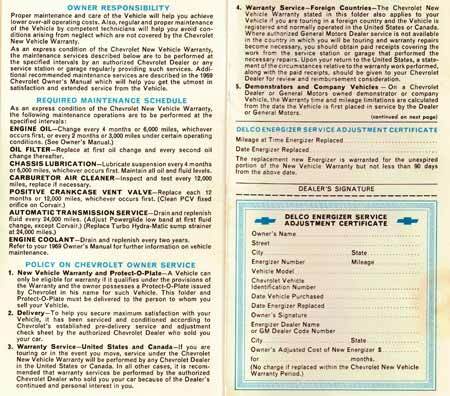 These pages of the New Vehicle Warranty spell out owner responsibilities, required maintenance schedules and Chevy's policy on owner service. There are specific mentions of Protect-O-Plate provisions made here. Gary Esse, a noted Chevrolet collector and promoter of a large car show in Jefferson, Wis., told Second Chance Garage, "The dealers were pretty serious about the Protect-O-Plate program back in the '60s." He said that GM explained the program in the front of parts manuals. "A piece of tape pulled off and the plate got glued to the warranty book — now collectors use the Protect-O-Plates to document their cars." Esse said Protect-O-Plate documentation is especially important in the Corvette hobby. "It's a real GM thing," he noted. Warranty booklets with Protect-O-Plates still inside can be found on eBay and other online sale sites and auctions. Prices start as low as $10-$15, but Esse said they would go higher if the owner of a particular car was bidding for the plate that matched the specific vehicle. "What's nice is the VIN and original owner's name are stamped on the Protect-O-Plate," Esse pointed out. "In some cases, it can help you trace the car right back to the guy who bought it new."